Every day, Watch This offers staff recommendations inspired by the week’s new releases or premieres. This week: In honor of the premiere of WGN’s Underground, we’re revisiting our favorite television episodes featuring a great escape. The evolution of Steven Universe is nothing short of masterful. It started out as a light-hearted cartoon about a young boy and his three magical guardians battling monsters. It grew into an epic story of galactic conflict, held together by characters who fascinate in their histories and relationships to each other. It’s a show about growing up, about acceptance, about the full spectrum of love, all of which creator Rebecca Sugar and the rest of her writing staff treat carefully, without any dumbing down of big ideas for a younger audience. 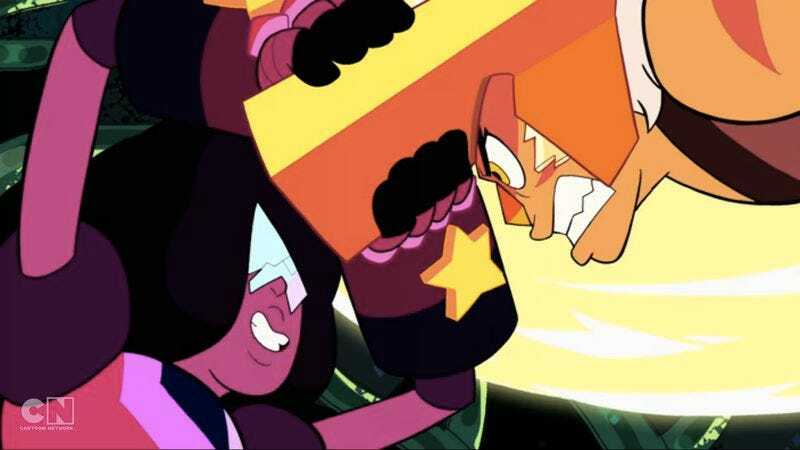 Steven Universe’s commitment to this process was readily apparent in the first season finale, “Jail Break.” The brutal homeworld that the Crystal Gems fought against thousands of years ago, foreshadowed throughout the first 50 episodes, makes a dramatic reappearance in the brutal Jasper and the coldly mechanical Peridot. Our heroes are soundly beaten and imprisoned for judgement, and things are the bleakest they’ve been all season. The episode’s starship environment is cold and inorganic, bereft of any of the life that runs through Beach City, making it apparent for the first time just what kind of enemy the friends are up against. But all of “Jail Break”’s obstacles can’t sabotage the joyful core that is the title character. Steven’s been hit with a lot of new information (and with Jasper’s forehead), but none of it makes him wallow in confusion or doubt for even a second. All he wants to do is find and free his friends, and when he encounters new Gems named Ruby and Sapphire on his way, he wants to help them do the same. He doesn’t have a clue who they are—or who they can become, in a terrific reveal of Garnet’s true origin—and he doesn’t care. His empathy for their situation is as much a vital part of his humanity as the fact that he can walk through force fields and only suffer a mild case of static electricity, and both are equally important to the escape. Toward the middle of the episode, Steven encounters his old friend/foe Lapis Lazuli in another cell, who rejects his offer of help, begging him to surrender to the hostile Gems. He protests, “But they’re… mean! They hurt my friends, they hurt my face!” “That’s why we can’t fight them,” a defeated Lapis tells him. “That’s why we have to fight them,” Steven replies. That sentiment is a powerful mission statement for Steven Universe as it continues. Its mythology may grow more complex and its crises may become more personal, but at the center is an immutable core of positivity: a kid who just wants to do the right thing. Availability: “Jail Break” is available for individual purchase on iTunes and Amazon, and is currently streaming on Hulu.